This is without a doubt the best game of the round. A titanic struggle! 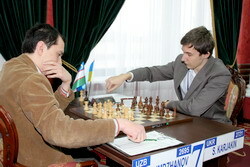 The players’ tasks surpassed human abilities, but for a long time both grandmasters produces the moves of the highest quality. The outcome of the game was decided by the clock. Svidler did everything a little bit quicker and more practical. 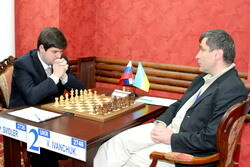 Ivanchuk got into the horrible time trouble, blew his advantage, and fell down. There were many interesting moments to point out. I will note Peter’s daring novelty 13.g4!? and a number of exceptionally strong moves by Vassily, who managed to refute White’s wing activity with the powerful central counterplay. The deciding moment of the game was quite dramatic. Both players overlooked the 23…Qa4! resource, which could give Black an edge (therefore White had to put the pawn on g5 without taking on e6 first), and then Ivanchuk incorrectly rushed taking on f2. He could maintain the tension by 25…Qf8! After the text-move White came up with a fantastic resource – 27.gxh6! !, and Black had no checks to seriously bother the White’s king. Black’s flag fell at the same time when Vassily resigned the game. Black easily solved the opening problems. The 6.g3 variation of the Slav Defense, selected by the former world champion, is considered harmless, and this game did not shake the conclusion. By 7…c5! the Wijk aan Zee winner transposed the game into a Catalan-like structure, and initiated major simplifications. His energetic rook maneuvers (17…Rd5!, 20…Re5+!) forced the opponent to repeat the moves. The game ended in a friendly way without much trouble. Pavel did not dare risking a large scale battle against an uncomfortable opponent. In the Meran Slav he allowed Grischuk to carry out the freeing с6-с5, and the subsequent simplifications clarified the following assessment: total equality. A just and fair draw. 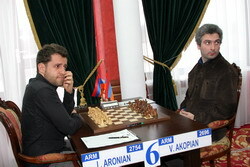 The younger player of the Armenian Olympic team painfully squeezed a victory in the game against the elder one. Vladimir, in my opinion, played too passively. 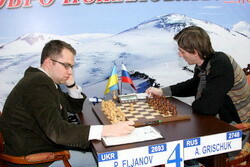 In the Slav Defense the board was quickly crossed by the pawn chains, and the game entered the slow maneuvering stage. I am not sure in Black’s 12th move, which gave White freedom on the queenside. Perhaps Black should have maintained the tension. Later in the game White methodically attacked Black’s weakness on c6, while his opponent for some reason did not look for countermeasures. I think Black could try e6-e5 on 23rd or 26th move, in order to get some hopes of equalizing. However, Akopian played passive and was eventually smothered to death. Starting from the move 31 and till the end, Aronian played a perfect endgame and created a textbook example of converting the advantage. This game is full of fine nuances. Evgeny tried to use an unusual opening move order in his favor. If he played 13…0-0, White could seize the control over the e4-square by 14.Rfe1!, obtaining a well-known position with an advantage. Black’s 13…Ne4!? provoked immediate crisis. Boris accepted the challenge and stroke in the center. He managed to keep the enemy king in the center, but failed to create a dangerous attack, because of the exchange of the queens. 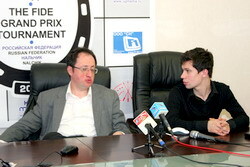 Having realized that he may end up in a worse ending, Gelfand sacrificed an exchange (25.Rxa7! ), and it all started to look dire for Black. However, Alekseev cleverly returned the material (26…Rxe5! ), which led to an easy draw. Almost every game of the American grandmaster can be printed in an endgame manual. This time he played for the stronger side, but the game was nevertheless drawn. In the Marshall Attack the players went for an old and well-explored line. A complex ending arose; Black’s bishop pair almost compensated for White’s extra pawn. The dispute does on for decades. 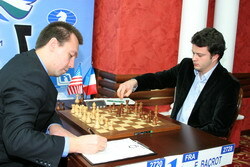 One of the recent examples is Caruana-Sargissian, Merida 2008. In order to equalize, Black must advance the kingside pawns to create weaknesses in White’s camp. However, Bacrot preferred his own way, which proved wrong. Unsuccessful maneuvers 25…Ra8 (better is 25…f6 or 25…g5) and 30…Bf8 (30…Kf8! is clearly better) allowed White activating his pieces. The threat of exchanging the dark-squared bishops forced Etienne to enter a difficult ending with opposite-colored bishops and a minimal pawn deficit. However, the Frenchman managed to survive. Maybe White’s game while the rooks were on the board can be improved. The bishop ending (after 46.Kxc3) was not rosy for Black either. White would win if he could obtain the connected passed pawns on f- and g-file, but Black skillfully defended against this possibility and held a draw on fine nuances. Black made an important improvement in the Rauzer Sicilian – 14…Qc5! (earlier moves are 14…h5 and 14…Qa7), which allowed his to trade the queens, as the standard 15.Qd3 would lose a piece after 15…b4! Still, White retained certain pressure in the endgame. Leko did everything he possibly could. His skillful maneuvers (16.Bh5!, 23.a4!) weakened the opponent’s position, and then he even managed to break through in the center (26.d6! ), but the drawing tendencies were too strong, and the opposite colored bishops didn’t help White either. 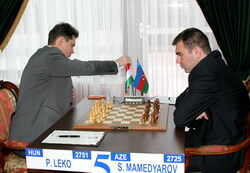 Mamedyarov defended accurately, and the draw is in order.